I've been struggling a bit to get posts up on the events I've been attending on the blog in a timely fashion because at the same time I don't want to bombard you all with them since this is primarily a personal style blog (and I'd like to keep it that way). I've been aiming to alternate them with my outfit posts and all the event coverage will still be published in chronological order so I hope you don't mind too much that they go up a little later than real time. I don't normally have this many fashion related events on anyway, it's only these past two months that have been particularly busy. 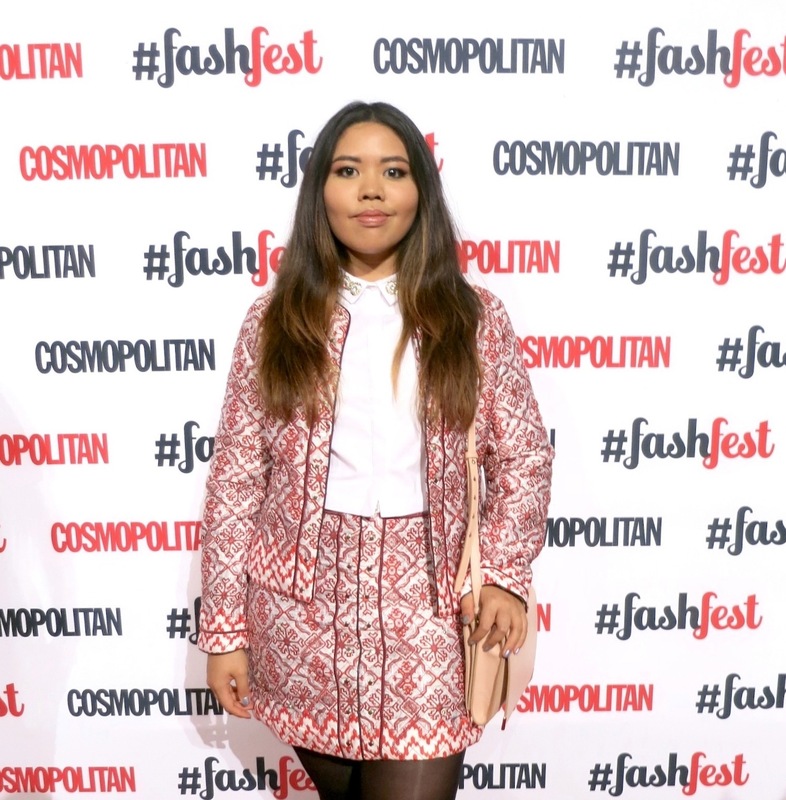 So with that explanation aside, last month I, along with the other Cosmo Blog Awards nominees, attended the Cosmo FashFest: Cosmopolitan's catwalk fashion show. Held in the Battersea Evolution Marquee secluded in the depths of Battersea Park, there was initially a bit of a kerfuffle getting in when the doors opened as there were around 1 000 guests and no rhyme or reason to checking people off the list and assigning table numbers. After quite a long wait, we were finally in and free to wander around the first area. 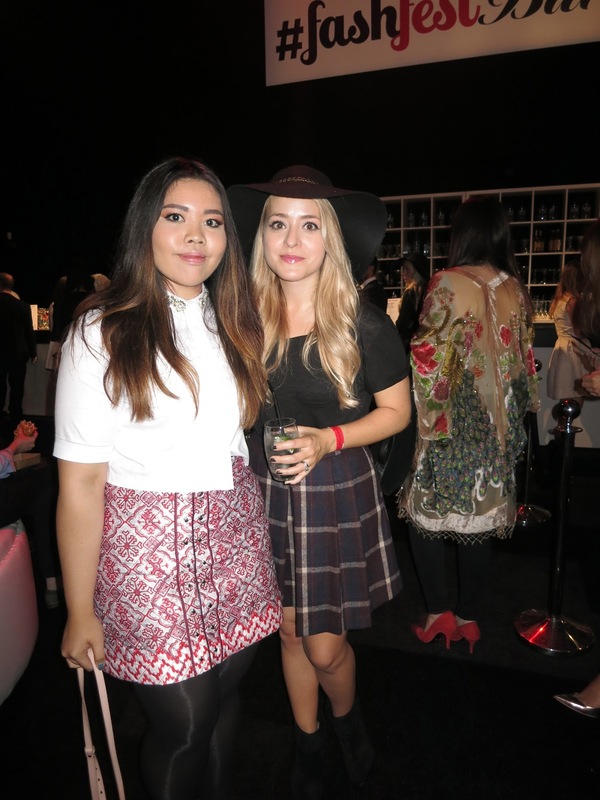 There was a bar serving food and drinks and I bumped into Fleur of Fleur de Force, it was so lovely to meet her and I loved her Primark hat and skirt! While we waited for the catwalk show to start, there were free manicures courtesy of Barry M and Dermalogica offered complimentary skin consultations. Just before the show I also ran into Millie Mackintosh, who was wearing a dress from her own clothing line. At 8pm, the curtains were lifted to make way into the second room where the catwalk show was due to start, we were seated around tables before host Laura Whitmore introduced the event and DJ Krystal Roxx took to the stage to provide the music. The fashion show modelled the latest pieces from high street labels such as ASOS, River Island and Next. I was especially impressed with ASOS' new collection for autumn/winter, they had plenty of pastel coats which I think would be perfect to inject some much needed colour into a winter wardrobe. I also fell in love with this particular dress, the 'mermaidy' material looked even more eye-catching in real life! The show wrapped up in about an hour's time and while they were gearing up for an afterparty, I decided to call it a night. Cosmo sent us home with a spectacular goody bag (they always do the best ones in my opinion) and I was already making up a mental wishlist of all the lovely items I saw on the catwalk that needed to be mine. I am so jealous you got to go this event!! Lucky girl! You look lovely too!! This looks like it was such a wonderful event! I absolutely love what you wore, too! Well done you for being invited to all these amazing events, I would love that! Love that skirt amazing girl! x A. That set is amazing! Great outfit!